Use Docsvault’s email templates to save time and maximize efficiency. Stop copy-pasting emails. Use Docsvault’s email templates to save time and maximize efficiency. Home/Blog/Stop copy-pasting emails. Use Docsvault’s email templates to save time and maximize efficiency. Many times you may have noticed your team making blunders while sending the same kind of emails by copy-pasting their old emails in order to save time. Docsvault provides an innovative solution, viz. Email Templates, that makes creating and sending repetitive emails faster and error-free. 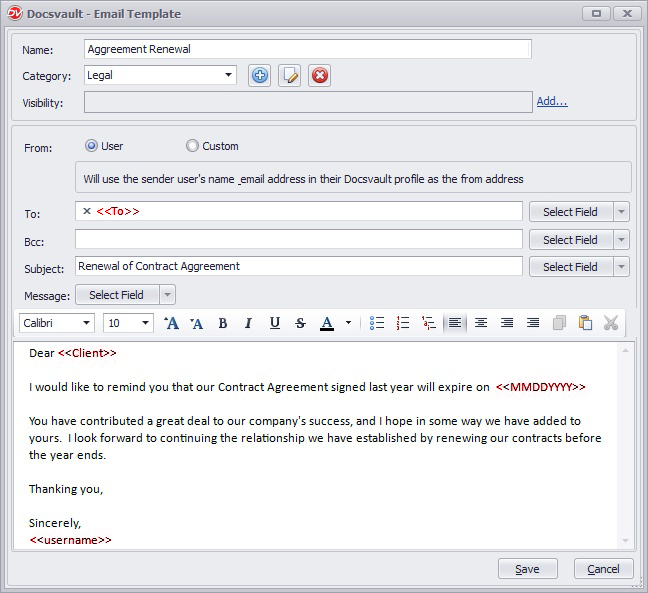 Docsvault’s Email Template feature allows you to create multiple draft emails which can be used to create repetitive emails. Email Templates support merging a document’s profile values in your email to add content dynamically. Instead of using copy and paste or manually entering information, drop dynamic fields into your email and the information will be automatically populated with values from a document’s profile. For instance, sending emails for periodic payment reminder or agreement renewal. The image below displays the merging dynamic fields in email template. The simple act of using an email templates can completely overhaul your email process. Here are few highlights.